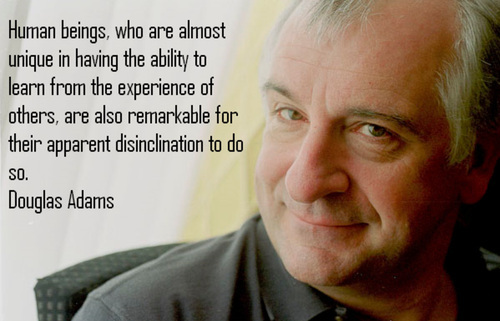 While delightfully tempting, given he was an atheist like me it seems rather silly on the tenth anniversary of his passing to wish Douglas Adams all the best up there with the falling whales, bowls of petunias and sleek starships in the shapes of running shoes. Instead I'll simply pay my respects to quite possibly the world's most entertaining, hilarious, imaginative, intelligent and friendly authors, and to be thankful for all the works he created that continue to fill my life and the lives of so many others with joy. 101010. My beautiful late mum was the one who introduced me to Adams' work. If we needed any further proof karma is bunk, it's that both left us too soon.